Dieselcraft on-board centrifuge helps spin out heavy contaminants missed by oil filters. Extended drain intervals and less engine wear are possible with Dieselcraft's Magnum Model 180AP and OC-25 centrifuge for on-board engine oil cleaning. The bypass oil cleaning centrifuge uses 12-24 VDC to spin engine oil (bypassed around the full-flow oil filter) up to 6,000 rpm to sling out heavier contaminants that might be missed by the filter. Regular oil filters usually filter to 25 microns, but are only about 80% effective -- leaving 20% of the filtered oil containing larger particles. Also, tolerances in an engine are usuall 5 to 20 microns under load, so larger particles can cause wear. Dieselcraft's OC-25 centrifuge spins engine engine oil at 6,000 rpm to whirl out the heavier solid contaminants missed by conventional full-flow oil filters. The Magnum 180AP and centrifuge is less than 10 inches tall and not quite 5 inches in diameter. 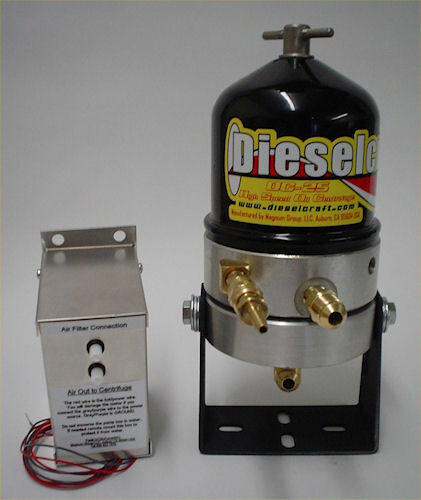 It handles just under a gallon of engine oil a minute and its unique oil return system allows it to be used on many diesel and gasoline powerplants -- anything that uses an oil pump and has 12 or 24 VDC. For more information on the centrifuge and oil cleaning, visit www.dieselcraft.com.